As Flyers enter home stretch, is Couturier's added workload catching up with him? 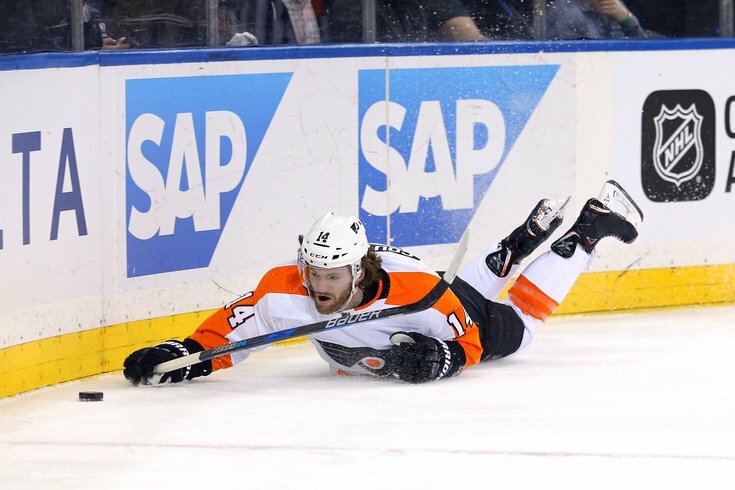 Philadelphia Flyers center Sean Couturier. VORHEES, N.J. — The Flyers are two points behind the NHL’s Metropolitan Division-leading Washington Capitals, and one point behind the two-time defending Stanley Cup champion Pittsburgh Penguins, despite coming off a five-game winless streak that ended over the weekend and a 10-game winless streak earlier this season. A big reason why the Flyers are in this position is because of Sean Couturier, who’s been sensational for most of this season, posting career-best marks in goals (29), assists (34), points (63), shots on goal (201), game-winning goals (6), plus-minus differential (plus-25) and average time on the ice (21 minutes, 34 seconds). The last stat, however, could be prescient. After being moved to the first line at the beginning of the season – originally teamed with Claude Giroux and Jake Voracek, now Travis Konecny – Couturier’s offensive output makes him one of the biggest surprises of the season ... and one of the NHL’s best two-way centers. But are all those extra shifts beginning to wear on Couturier? Since Feb. 22, he’s produced just three points – all assists. He hasn’t scored a goal in nearly a month (Feb. 16). He’s gone scoreless in the Flyers’ last four games — his longest scoreless stretch this year. And through 69 games, Couturier has played 1,488 minutes, putting him on pace to shatter his previous season-high for minutes played (1,565 in 2013-14). Given his average ice time, he'll likely pass that mark with about nine games left to play – not counting any additional playoff games. By the end of the regular season, Couturier could be over 1,700 minutes played. Unless, of course, something changes in the meantime. In the Flyers’ 2-1 win over Winnipeg on Saturday, which broke the Flyers’ five-game winless streak, Couturier played 20:17, the lowest amount of playing time he’s received in 10 games, since going 18:14 in the Flyers’ 7-4 win at the New York Rangers on Feb. 18. If it’s not the ebbs and flows of a season, and it’s not fatigue, then what it the cause of Couturier’s reduced production? “Sometimes [playing minutes are] a little dictated by the flow of the game, dictated by matchups, and I would say that was more so the case [against Winnipeg],” Hakstol said. “No, I don’t, I haven’t seen any fatigue in his game at all. “I see the opportunities there and as long as the opportunities are still there, I won’t be overly concerned with [Couturier’s reduced production]. Like I said, I don’t know how I can be any more plain. I don’t see fatigue in Coots’ game. I see him playing really well. Teams might be checking that line with a little more purpose, because of the success that they have had for a good stretch. Flyers' general manager Ron Hextall feels the same as Hakstol about Couturier. “You’re going to go through your little ups and downs during a season no matter who you are,” Hextall said in reference to Couturier’s scoring slump. “Coots I guess offensively you can say is a little down right now, but we’re not concerned about it. Coots plays the game the right way. He plays on both sides of the puck.